Note: This is the bound book only and does not include access to the Enhanced Pearson eText. To order the Enhanced Pearson eText packaged with a bound book, use ISBN 0134412087. Language Development From Theory to Practice provides a survey of key topics in language development, including research methods, theoretical perspectives, and major language milestones from birth to adolescence and beyond, and language diversity and language disorders. Each chapter bridges language development theory and practice by providing students with a theoretical and scientific foundation to the study of language development. 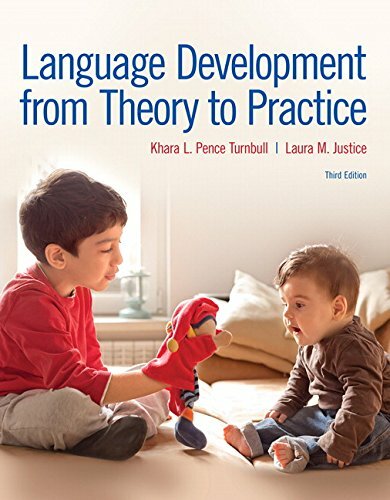 The authors emphasize the relevance of the material to students’ current and future experiences in clinical, educational, and research settings; emphasize multicultural considerations and how they affect language development; focus on using evidence-based practices for making educational and clinical decisions; show the relevance of a multidisciplinary perspective on the theory and practice of language development; and include a number of outstanding pedagogical features to motivate and engage students. The new edition builds on the strengths of the earlier editions while featuring a chapter reorganization that promotes better understanding, more detailed coverage of topics of particular interest to students, expanded categorization of language-development theories, and a variety of helpful new pedagogical features. The Enhanced Pearson eText features embedded videos and assessments.